Bow-Wow-Wow! Summer is ending, and with it comes the start of a new school year! Lord Nelson is taking a much-needed summer vacation and asked me to fill in for him this week while he is away. My name is Andy, and I am a member of the Rutgers University Seeing Eye Puppy Raising Club (RUSEPRC). I am just about ready to head back to Rutgers with my student handler, Amber. You heard right! — At Rutgers, dogs go to school too! But we’re not just any dogs. As a part of the RUSEPRC, we play a special role here at Rutgers, giving students in the club an opportunity to learn to raise and train future service dogs. These dogs (like me!) will then go on to have important jobs helping people in the community. to one of the Rutgers University Mounted Patrol Horses. Photo by Dan Houng. 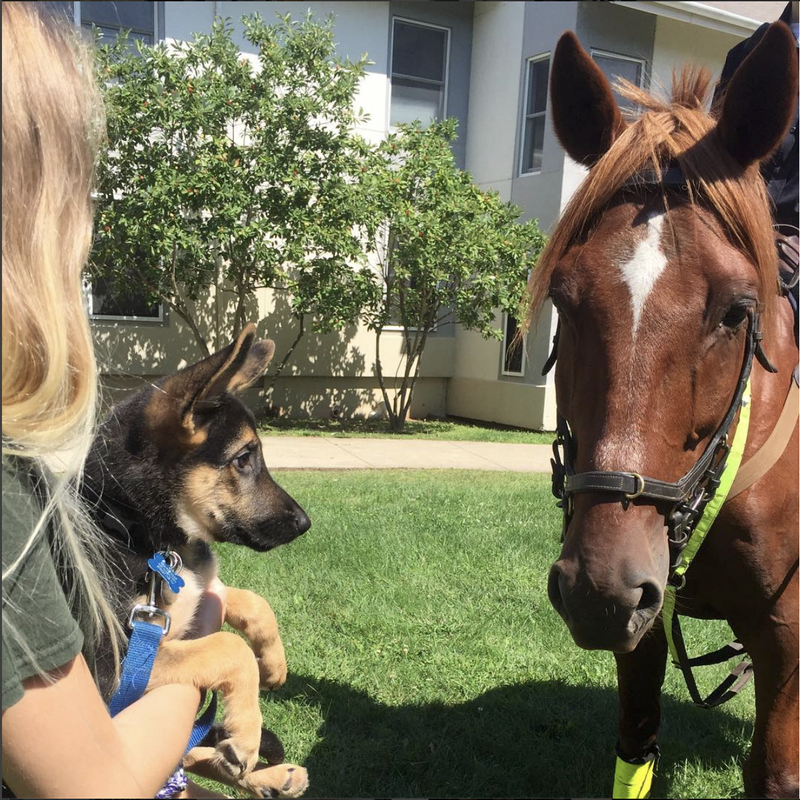 This year, the students and dogs of the Rutgers University Seeing Eye Puppy Raising Club will be helping out the folks at the Equine Science Center by volunteering at the 7thAnnual Open Space Pace and Festival of Horses in Freehold, New Jersey, on Saturday, September 15th. The Open Space Pace works to promote and rejuvenate New Jersey’s harness racing industry and to preserve open space in our state. The event opens with a parade from the Freehold Hall of Records to the Freehold Raceway. And guess what? All of my friends and I in RUSEPRC have been asked to march in the parade! Come on down to see our debut in the parade and then join us at the Raceway for a full day of educational exhibits, amateur horse races, live music and family-friendly entertainment! The best part – any college students who attend can enter into a drawing for $1000 scholarships to be given out throughout the day! For more information on the Open Space Pace, visit http://openspacepace.org. To learn more about the Rutgers University Seeing Eye Puppy Raising Club, check our website: https://ruseprc.com. Thank you so much for letting me fill in for my bud, Nelson, while he is on break! Maybe I’ll get a chance to meet you at the Open Space Pace!